Attention grade 9 students: The Johnson Horizon Scholarship 2016 is open to grade 9 students across the province. It is valued at $1200.00 ($200.00 received in August of this 2016; $1000.00 applied automatically to tuition upon entry to Memorial University). Selected candidates are then welcomed into a leadership development program that will work with them throughout high school and will extend into their time spent at Memorial University of Newfoundland. All schools in the NLESD with a grade nine class are eligible to nominate one student to enter into this program. Please note that MDJH will select and submit one student from its applicants to the Horizon’s Selection Committee. Not all applicants will be awarded a scholarship. Please return applications to Ms. McCue or Mrs. Hackett by Tuesday, March 22nd, 2016. There will be NO extensions to accepting these applications, thus students who do not pass it in on time will not be guaranteed that their application will be entered. Please see the link for more details. Please see attached for a wealth of information of things happening at MDJH. File is in PDF. We have all seen an increase in the price of food at grocery stores in recent months. Doing more with less has become something many families have had to do to adjust to the rising cost of food in this new economic climate. Our Kids Eat Smart Clubs are no different. During this school year, we have seen a significant increase in the cost of food and supplies for our Kids Eat Smart Clubs. Our KES Club volunteers are very cognizant of the need to ensure the best quality of food for our children at the best possible prices. It is important to increase awareness and fundraising efforts to ensure we sustain our Kids Eat Smart Clubs. This new initiative, for Wednesday, March 16, 2016, is a food drive focusing on Breakfast items to fill our Kids Eat Smart Club cupboards. It is important, that your school participate to help collect food. 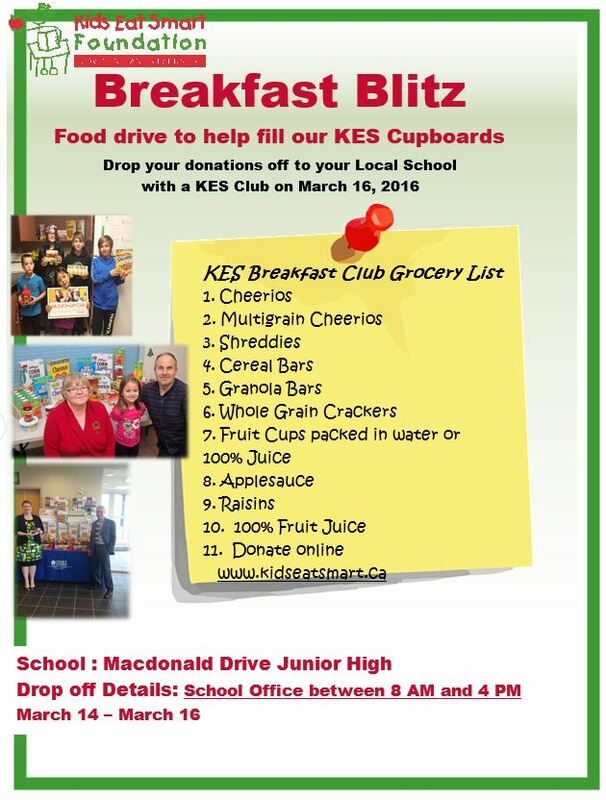 We are asking businesses, community organizations and individuals to collect food for your KES Club and drop it off to your local school on March 16th. For people who wish to contribute but cannot make it to your school, they can DONATE online at http://www.kidseatsmart.ca/donate. Online donations can be designated directly to your school. Thank you for everything you do, every school day. The following documents / PowerPoint will aid grade 9 students with course selection for grade 10 high school. Please note that the Level I Course Selection Sheet is due to homeroom teachers by Monday, February 29th. Should parents/students have questions or require guidance please see Mr. Squires in the office. Please see attached PDF for this week’s newsletter. It is quite lengthy.